Easter season is well upon us and the treats are getting out of control. Although we love hot cross buns and will forever hold them close to our hearts, we would be lying if we said that, after our exhaustive roundup of the best in town, we weren’t on the verge of seriously overdoing it. Thankfully, Easter offers up a raft of delicious and creative treats that allow us to venture outside the confines of the classic bun. 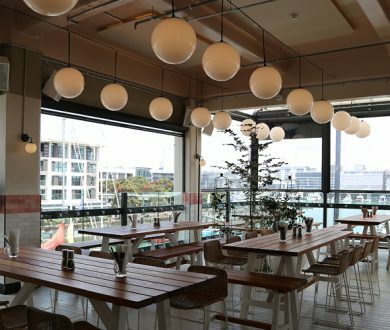 Whether it’s with cookies, cakes, doughnuts, or even bagels, there seems to be a limitless number of ways to add Easter jazz to food, as these eateries around Auckland prove. 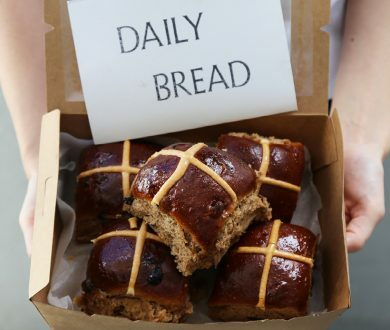 The original hot cross bun cake from The Caker took Auckland by storm in 2015, now garnering as much excited anticipation from the public as the city’s best hot cross buns. The decadent, spiced cake is filled with dark chocolate chunks, currants and candied orange, topped with a cream cheese icing that has been infused with cinnamon and finished with sprinkles of chopped hazelnuts, Valrhona chocolate pearls and a cinnamon-ganache-filled House of Chocolate Easter bunny. This year The Caker has also introduced a brand new cake to its Easter collection (perfect for those who simply cannot stomach sultanas). 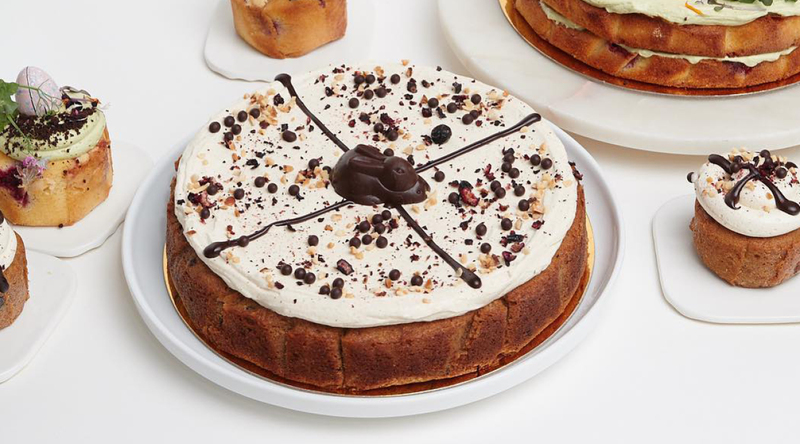 The Easter Egg Hunt Cake comprises a double-layered moist raspberry white chocolate cake and is topped with matcha cream cheese icing, cookie ‘soil’ and speckled eggs from House of Chocolate. The New Zealand Ice Cream Organisation recently released that per capita, our yearly consumption of ice cream and its related products was estimated to be between 22-23 litres. 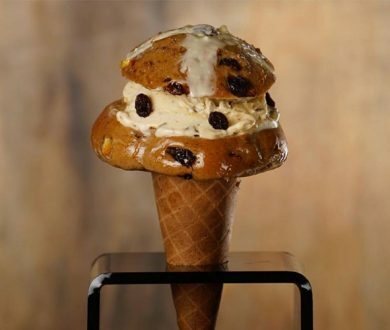 Well, those stats are set to rise even higher with the release of Little Lato’s spiced, hot cross bun gelato. 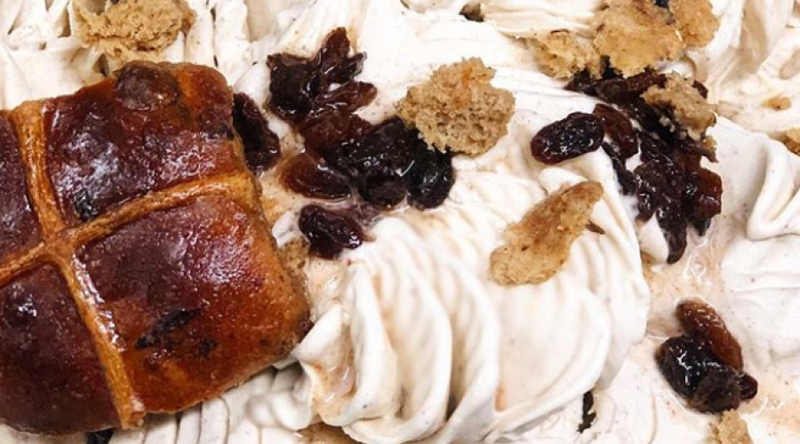 Available in both dairy and vegan form the creamy treat is made using hot cross buns from Crave Cafe and Kind in Morningside. If you’re after something a little more sweet and chunky, however, head over to Duck Island and get a scoop of its Easter special ice cream. Although less creamy than the gelato, the texture is nostalgic and the added chocolate in the mix offers a seriously indulgent flavour. Speaking of the Creme Egg, Orleans cannot go unmentioned in this round up, considering the return of its infamous Creme Egg milkshake. Filling classic milkshake glasses with what can only be described as liquid gold — Orleans’ concoction comprises a trifecta of treats, including chocolate, caramel and vanilla. 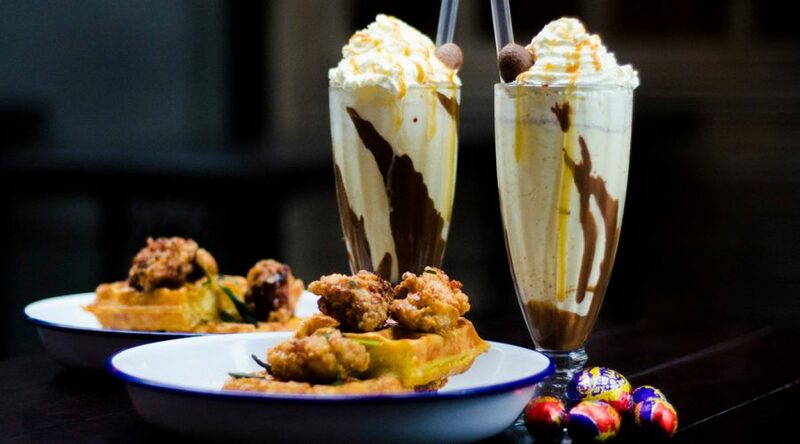 Inside, you’ll find smashed Creme Eggs and if that wasn’t enough to fill your boots, the milkshake is topped with a whole one, nestled in a swirl of whipped cream. While cookies might feel run-of-the-mill, this isn’t the case at Moustache, where Easter demands something extra. 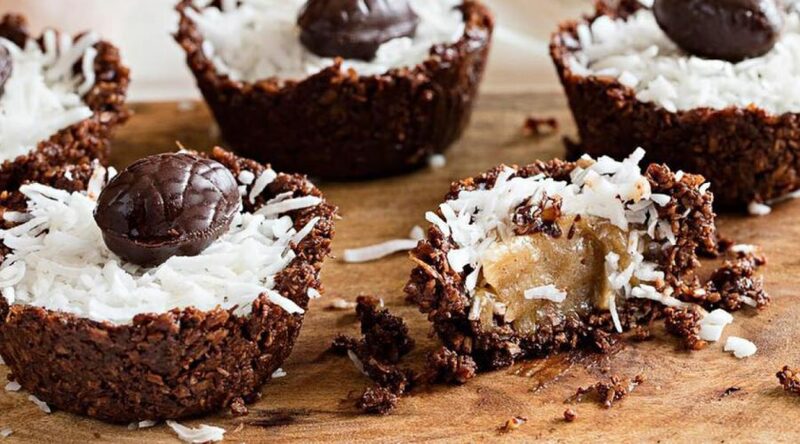 Moustache’s Easter cookie pies are ideal for all those with a sweet tooth and are filled to the brim with chocolatey goodness. The cookie pies come in two different flavours. One is filled with a whole Creme Egg that oozes out with each bite, while the other is packed with gooey chocolate and topped with speckled eggs for a heavenly crunch — we’ll let you decide which one is better. The bean-to-bar chocolate factory in Morningside is an absolute Easter haven this year. From Papa New Guinea milk chocolate eggs filled with housemade scorched almonds to Heilala vanilla and white chocolate eggs filled with chocolate-coated dried blueberries, it’s clear that Miann’s treats are on another level. The cabinets at all of Miann’s branches around Auckland also feature its Easter-themed macarons and petit gateaux. Our favourite? The six-pack carton of eggs which come in a range of delightful flavours and fillings. Vegans needn’t miss out on all the fun this Easter as Little Bird has your backs. This year, the plant-based eatery is rolling out its special raw cross buns and spiced carrot cakes. Both are refined sugar, dairy, gluten and soy free so are suitable for those with allergies and specific dietary requirements. Although a different experience to the baked goods we’ve mentioned above nobody should have FOMO on a public holiday, so hats off to Little Bird. Doe has a reputation for producing some of the fluffiest doughnuts in Auckland. Only opening once a week and keeping production numbers limited to small batches, Doe ensures that each doughnut boasts optimum freshness and is mouth-wateringly delicious. This week, the ladies at Doe are embracing the Easter season with their fruit spiced doughnuts, filled with orange and honey mascarpone cream. The other flavours include one filled with raspberry jam and another mixed-spice doughnut covered in cinnamon sugar — offering a classic with a twist. The go-to bagelry skipped the Easter season last year, but it’s back this year with its hot cross bagels — only available this week. The cinnamon raisin bagels are marked with a festive cross with an elevation in fruitiness which certainly gets us in the mood of the season. We recommend you pair this with the King Kong topping — a mix of caramelised banana and cream cheese which tastes like banana cream cheese icing. Topped with a sprinkle of almonds and chocolate drizzle that blends into the spiced bagel and its topping, this is a match made in heaven.